Following on from my review of The Quilters Applique Workshop by Kevin Kosbab, I’m sharing my latest finish… and why yes, it’s another cushion. How did you guess? With the wet dreary weather outside, capturing a good photo is proving to be a little difficult today. I received the book to review a little while ago and when I saw Kevin’s Counter Balance quilt, I was instantly inspired to use his design principal – just in a smaller scale. I had just finished a quilt which was made completely with solids. These fabric scraps were still on my cutting table, so I just took my rotary cutter and cut these shapes free-hand. Free-hand cutting can be a little daunting, but I was going with the flow and I think the shapes turned out just fine. A few little dots of appliqué glue kept the shapes in place. I then needle-turn appliquéd the shapes to the background lime green fabric with matching cotton thread. I have gone a little bit crazy lately in buying Aurifil threads, so I had all of these colours available to play with. Once the needle turn applique was complete, I put it aside for a few weeks as I had a number of other projects due for submission. I cleared my sewing table yesterday, and rediscovered this appliqued piece. With a rainy afternoon and the kids happy entertaining themselves, I put my new Bernina 710 through her paces. She is such a lovely machine and her stitches are just perfectly perfect. Last night, I was feeling confident with myself and even decided to attach a zip to the back of this cushion. I think it turned out quite nicely… even if the colour is quite ugly and it doesn’t match the front at all. 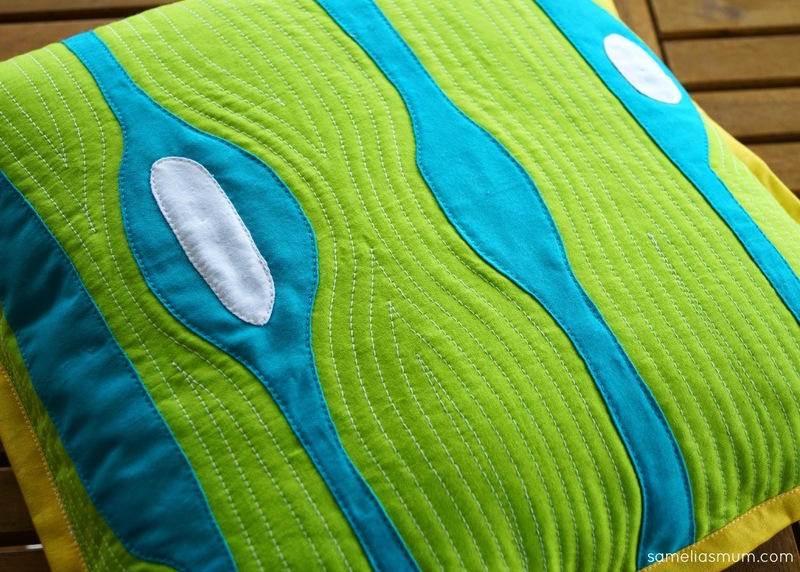 Why not grab your rotary cutter and cut into some scraps freehand to re-create this cushion. If you do make an ‘Inspired by Kevin Cushion’, please share your pictures in the Scrap Challenge Facebook Page. We’d all love to see your work. Be sure to follow me on Bloglovin’ (click the button below) so that you don't miss any of the future projects in the Scrap Fabric Challenge. Learn more about the Scrap Challenge here. I love everything about this cushion Anorina. The quilt that inspired you was one that caught my eye as I read your blog post reviewing the book it came from. I really like the colours you chose!